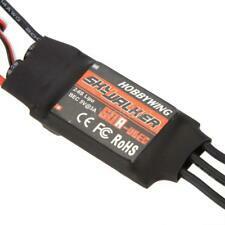 1 Hobbywing SkyWalker 60A Brushless ESC. Constant Current: 60A. Refresh Rate: 50Hz-432Hz. Maximum speed: 210000 RPM (2 poles motor), 70000 RPM (6 poles motor), 35000 RPM (12 poles motor). BEC Mode: switch mode. HK 60A Brushless ESC with 4A UBEC for RC Plane. 60A Brushless ESC with 4A UBEC. With a 4a sBec and range of programming features. Constant Current: 60A. Motor Type: Sensorless Brushless. A great budget ESC with a rock solid performance. 1 GoolRC 3660 3300KV Motor. 1 GoolRC Waterproof 60A Brushless ESC. KV(RPM/Volt): 3300KV. 4Pcs Brushless Motor Emax RS2205 2300KV CCW CW RC Drone Racing Quadcopter UK. Over Head Headphone Bluetooth Earphone Teens Kids Children DJ Adjustable Headset. 1 GoolRC 3650 4300KV Motor. 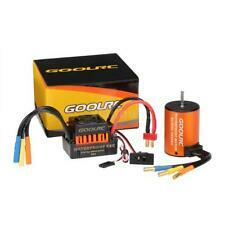 1 GoolRC Waterproof 60A Brushless ESC. The origi-nal upgrade waterproof 3650 4300KV brushless motor with 60A ESC combo is designed to provide both quality and performance at an affordable price. 1 60A Brushless ESC. Compatible with sensorless brushless motors. The strong resistant current capability, excellent heat dissipation. Motor Supported: sensorless, brushless. Internal timing can be changed easily to make the ESC suitable for various of motors. Condition is New. This translates in to very smooth start up and acceleration. 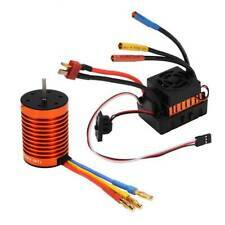 Motor Type:Sensorless Brushless. Programming Options (Via Optional programming card). Shaft dia.:3.175mm. Shaft length:15mm. Hobbywing patented heat-conductive copper bar cover on the power board of the QUICRUN 10BL60-SD, which can efficiently and effectively transfer heat to the integrated CNC machined billet aluminum heat sink housing, combined with high-performance cooling fan can keep your ESC as cool as possible. Motor Supported: Sensorless, Brushless. Input: 2-3 cells LiPo. Use top quality electronic components to enhance the current endurance ability of the ESC. Excellent start-up, acceleration and linearity features. Cont current: 60A. 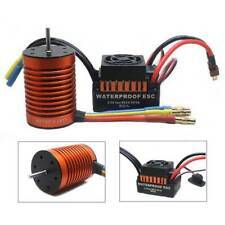 These series of water cooling ESC designed for RC boat. ESC weight: 52g. ESC size: 73mm 36mm 15mm. turn on your transmitter and move the throttle stick to the full throttle position (full up). Model: 60A V2. 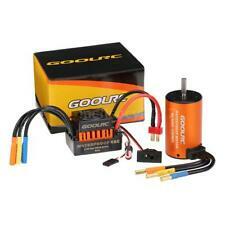 - Compatible with all sonsorless brushless motor. - Use top quality electronic components to enhance the current endurance ability of the ESC. - Excellent start-up, acceleration and linearity features.